In this paper the influence of concrete and reinforcement on the wave propagation of the acoustic emission (AE) ultrasound waves is studied by means of numerical simulations and an AE-measurement. The geometry of the test sample includes a tendon and reinforcement bars. The reinforcement bars do not have much influence because of their small diameter. The tendon leads to traveltime perturbations of several microseconds and to diminished amplitudes of the waves that are diffracted around the duct. Data from AE-events recorded during a tension experiment with a cross section similar to the model in the simulation were localized. The inhomogeneities were not taken into account, nevertheless a very good localization accuracy was achieved. All found events originated from the same crack in the middle of the beam. Other cracks also appeared, but the developing center crack strongly restricted the wave propagation across that crack. One of the reasons for the difficulty to develop and to apply acoustic emission (AE) testing methods for concrete structures (,) is the complex propagation of the ultrasound waves. Quantitative AE-analysis is based on the transient ultrasound signals recorded at piezoelectric receivers that are placed on the surface of the specimen. Single AE events are localized by means of the differences in the arrival times of the first waves between the sensors. In the localization algorithm it is assumed that the waves propagate on a straight line between source and receiver and that the propagation speed is constant for the whole test sample. In reinforced concrete, however, there are many inhomogeneities like aggregates, reinforcement bars, ducts and cracks. This surely has an effect on the wave propagation and on the waveform of the recorded signals. That is why a deeper understanding of the wave propagation is necessary to quantify the accuracy and reliability of the quantitative evaluation methods developed assuming homogeneous and isotropic behavior of the material. This shall be achieved by numerical simulations of the wave propagation as well as AE measurements on prestressed concrete members. The elastodynamic equations describing the wave propagation are numerically solved by the software "AEConcrete", which is based on the elastodynamic finite integration technique EFIT (, ). The simulations are performed in 2D, what implies plain strain. Thus, the amplitudes and the amount of scattered waves can not be given quantitatively, but all occurring wave modes and their travel times are the same as in the 3D case. Also synthetic waveform data are calculated for given receiver positions. The model has to be parameterized by a discrete regular grid. On each grid point three elastic parameters must be provided: the density r , the velocity of the longitudinal waves cL and of the transversal waves cT. The source is modeled as a point-like isotropic volume source, where the radiation of energy is the same into all directions. This source suits well for the study of the wave propagation, because only longitudinal waves but no shear waves are initiated. In principle it is also possible to model arbitrary sources like shear cracks or opening cracks by introducing their equivalent body forces (). The source signal has a maximum frequency of 200 kHz. The simulation is realized for the cross section of a reinforced concrete specimen with 440x440 mm edge length (Fig. 1). It consists of a polyethylene duct in the center, filled with 19 steel strands and mortar, and four steel reinforcement bars (Æ 22 mm) in the corners. The remaining area is filled with randomly distributed aggregates (70 Vol%) and pores (1 Vol%, max. Æ2 mm) in a cementicious matrix. The maximum grain size is 16 mm. The elastic parameters of the used materials are listed in Tab. 1, they result for the concrete in an average velocity of about cL = 4200 m/s. The model consists of 916x916 grid points corresponding to a grid width of 480 mm. The appropriate time steps are 57.5 ns. Fig 1: Discrete model of the cross section, consisting of 916x916 grid points. The simulation is carried out for a source in the cement matrix (depicted as star). Table 1: Elastic parameters of the materials used in the EFIT calculation. Snapshots of the wavefronts illustrate the propagation of the ultrasound. Two of them, taken after 31 and 75 ms respectively, are shown as examples in Fig. 2. Fig 2: Snapshots of the wave propagation taken 31 and 75 ms after the excitation by an isotropic volume source represented by the cross (+). The grayscale indicates the absolute value of particle motion. Because the aggregates have the same dimension as the wavelengths, the waves are not disturbed by single grains. Thus the wave front is circle-shaped in the beginning and travels with the averaged velocity and attenuation of the effective medium. In spite of the high velocity of steel the reinforcement bars cause a slight perturbation only. The high impedance contrast between the concrete and the PE-duct, however, results in a strong reflection as depicted in Fig. 2a. Energy is diffracted around the duct, and a delay in traveltime appears on the opposite side of the tendon (Fig. 2b). In the case of a steel duct it would be a traveltime advance. Furthermore there are reflections and mode conversions on the free surfaces of the model. Both snapshots show that there remains much energy behind the wavefront due to scattering at the aggregates. The range where signals may be detected is limited because the amplitudes decrease rapidly as a consequence of the scattering. In the recorded signals the pattern following the first onset is mainly formed by the interference of various reflected and scattered waves. It is difficult to detect the onset of later phases. Therefore for quantitative evaluation only the first onset of the signal is used. Traveltime data are calculated to estimate the time delay or advance, respectively, caused by a tendon duct. This is done for the source and sensor positions given in Fig. 1 and for a model with either a polyethylene or a steel duct and another model consisting of plain concrete without a tendon. For these three cases, the data of sensor S3 are compared in Fig. 3. These data are based on a 2D geometry. The residuals in a real 3D measurement will tend to be larger. The resulting traveltime residuals are Dt = -3 ms (steel duct) and Dt = 1.7 ms (PE duct), with regard to the arrival time of the undisturbed signal. Besides, a large difference between the amplitudes of the first onsets is apparent. This has consequences for the picking accuracy that in a real measurement would be further reduced when noise is present. Fig 3: Synthetic waveform data calculated for a model with a duct of polyethylene (dashed line), a duct of steel (dotted line) and without a tendon (solid line). The vertical dashed lines mark the first arrivals. An acoustic emission measurement was carried out during the loading of a tension member of prestressed concrete. The length was 5.84 m and the cross section 320x320 mm. The tension experiment was actually the preparation for a fatigue test to evoke tension cracks perpendicular to the longitudinal direction. AE-signals originate mainly from crack formation and crack growing in the concrete. It is studied whether an influence of the inhomogeneities on the data quality and the location accuracy can be observed. An eight channel acquisition system was used to record transient waveform data. A volume in the center of the specimen was chosen to be covered by the sensors as illustrated in Fig. 4. It had a length of about 0.6 m in order not to get too many cracks between the sensors. The stress was applied in several load steps. Fig 4: Test setup of the AE-measurement. The beam with a tendon and four reinforcement bars (Æ 16 mm) had a total length of 5.84 m. A volume in the middle was covered by the sensors. For the determination of the propagation speed each sensor transmits an ultrasound impulse, which is recorded by the others acting as receivers. cL is then calculated from the time differences of the arriving signals and the known distances between emitter and receivers. It was determined to 4225 ± 143 m/s, corresponding to cL = 4200 m/s of the concrete in the model for the numerical simulations. It is known which rays have to cross the tendon duct, but it is not possible to identify them on the basis of these calibration data. Fig 5: Data of one AE-event, recorded at the 8 transducers. The vertical lines mark the picked first arrivals of the waves. Single AE-sources are localized using the localization algorithm "HypoAE" (). E.g. in load step L2, 50 events could be found that were detected on all eight sensors. For 29 of them the data quality was good enough to pick at least six waveforms. A data sample for one event is shown in Fig. 5. The picking was done manually. Finally, for 24 events the localization algorithm converged and they were localized with a standard deviation of less than 37 mm in lateral and even only 16 mm in longitudinal direction. The located events are shown in Fig. 6. All localized events had a good data quality and the first arrivals could be identified clearly. Also the localization errors are remarkably small. Fig 6: Localized AE-events and their standard deviation for load step 2. Projections of the source coordinates in plan x-y (a), in the elevation x-z (b) and in the cross section y-z (c). x = 0 indicates the middle of the beam. The sensor locations are shown as crosses, pro-jected in the respective planes. All events belong to one crack that developed within the region covered by the sensors. Thus, the monitored volume was separated into two parts. Events were recorded by the sensors located on one side of the crack, only. The AE-energy could not be registered beyond that crack. In this paper the behavior of acoustic wave propagation in a reinforced concrete sample is described. Especially the influence of the duct is studied. Numerical simulations show how the propagating wave field is modified compared to a homogeneous model. Where the direct path is inhibited by the duct, traveltime perturbations of several microseconds are induced. Reinforcement bars have less influence due to their small diameter. Altogether, these perturbations are often exceeded by the usual picking errors in noisy data. Waves that were diffracted around the duct have a smaller amplitude and less impulsive onsets. This makes the picking more difficult and is a source of additional errors. In the AE-measurement of the tension crack, the localization was not very susceptible to errors in the picked arrival times. This depends on the sensor covering of the source area, that was quite good for AE-sources coming from inside that volume. A more serious problem for quantitative analysis methods is the occurrence of cracks. Open cracks represent barriers for the propagation of the ultrasound waves. The signals reach the receivers beyond that crack on a devious path or not at all. Therefore, in the tension experiment no AE-events from beyond the next cracks could be detected. The authors wish to thank Dr. Frank Schubert, EADQ Dresden, for providing the software "AEConcrete". The research is funded by the Swiss National Science Foundation. Ohtsu, M.: Basics of Acoustic Emission and Applications to Concrete Engineering. Mat. Sci. Res. Int., Vol. 4, No. 3 (1998), pp. 131-140. Berthelot, J. M.; Robert, J. L.: Modeling Concrete Damage by Acoustic Emission. J. of Acoustic Emission, Vol. 6, No. 1 (1987), pp. 43-60. Fellinger, P.; Marklein, R.; Langenberg, K. J.; Klaholz, S.: Numerical modeling of elastic wave propagation and scattering with EFIT - elastodynamic finite integration technique. Wave Motion 21 (1995), pp. 47-66. Schubert, F.; Köhler, B.: Numerical Modeling of Elastic Wave Propagation in Random Particulate Composites. Nondestructive Characterization of Material VIII, Plenum Press, New York, (1998), pp. 567-574. Schubert, F.; Schechinger, B.: Numerical Modeling of Acoustic Emission Sources and Wave Propagation in Concrete. NDT.net Vol. 7, No. 9 (2002), http://www.ndt.net/article/v07n09/07/07.htm. 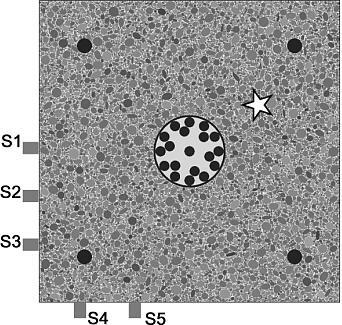 Grosse, C.; Reinhardt, H.; Dahm, T.: Localization and classification of fracture types in concrete with quantitative acoustic emission measurement techniques. NDT&E International, Vol. 30, No. 4 (1997), pp. 223-230.